Though I’ll always have a fondness for the original Transformers cartoon, I grew up watching what remains the best piece of animated Transformers fiction: Beast Wars. For the uninitiated, it’s the epic battle between the Maximals and the Predacons, the descendants of the Autobots and Decepticons. It takes place 300 years after Generation One… but 70,000 years in our past. If the time travel headache is kicking in, get the aspirin ready, because the subject of this review keeps the time travel going. See, aside from some convention-exclusive comic books, the Beast Wars had never made the jump to comics. Simon Furman and Don Figueroa intended to do a Beast Wars series for Dreamwave. 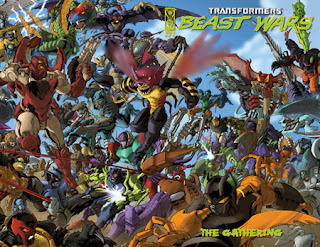 With that company’s demise, the same team took the idea (and possibly the same story) to IDW, launching the Beast Wars’ full comic book debut. Beast Wars: The Gathering follows the Beast Wars toys that didn’t make it onto the show. Because Beast Wars was computer-generated, it was quite expensive and could only animate few characters at a time. (And that was without shadows.) So the majority of toys released in the line never made it to the screen . . . in America. Japan’s Transformers fiction in the form of Beast Wars II and Beast Wars Neo had traditional cel animation, meaning many more characters could appear there affordably. Many of Japanese characters appear in The Gathering, along with many who have only been toys. Of the actual show characters, only two have substantial roles. I won’t spoil who they are, however. To understand the main plot, I’ll have to recap an important element of Beast Wars. The way new characters were introduced (for the most part) was through stasis pods containing bare-bones protoforms that had no personalities. They were all Maximal initially, but some were turned evil through a computer program. Most of these pods were never used and were thought to be destroyed at the start of season 2. But The Gathering retcons this and introduces the Predacon general Magmatron, who harvests these stasis pods to create new henchmen. It’s a plan similar to John Varley’s story “Air Raid” (later known as Millennium), in which people that were never supposed to exist are recruited into a time travel scheme. Of course, Magmatron’s plan is faulty thanks to a traitor in his ranks, and the result is a second round of Beast Wars taking place at the same time at the first, but removed in the time stream. Like Stormbringer, The Gathering is not for Transformers newbies. The story relies a lot on cameos, including one from Grimlock, and on its interactions with the original series. But there’s still lots of fun fighting, all of which is drawn by the George Perez of Transformers, Don Figueroa. The Gathering was probably a challenge for him, as he is better known for drawing vehicles, not animals. He does a pretty good job, especially since the anatomy for these animals does not have to be exact. For instance, a character that turns into a mosquito is larger than one that turns into a frog. (They did it with Waspinator, amongst others, on the show.) He does get a few scenes on Cybertron, including being able to draw a Lio Convoy that turns into Liger Zero. Don’s faces are very expressive, even with the characters that don’t have normal mouths or face shapes. It’s all in the eyes, even in the beast modes. When a character is scared, you’ll know. A few great expressions to look for are Ramulus when he gets attacked, Optimus Minor at pretty much any scene he’s in and just about everyone the big final battle in which feathers and teeth go flying. There’s also some great detailing, such as the blotchy skin on Torca, including his Maximal insignias. As well, the storytelling is pretty solid, which was one of the complaints I had with Stormbringer. The Gathering is more accessible than Stormbringer. Since the vast majority of characters have their debuts here, the only real back story one needs to research is the original Beast Wars television series. There’s some nifty time travel involved and some good action all around. A warning: this is one of the harder trades to find, as it was one of the very first Transformers trades released by IDW. I had to hit six book stores and three comic book stores before I found one. However, IDW is pretty good about getting their material out, and The Gathering will probably be reshipped or reissued soon, probably along with its currently ongoing sequel, The Ascending, or the Beast Wars Sourcebook.